Ancient India FoodThe excavation of the Mehrgarh period sites around 8000-6000 BC throws some startling facts about ancient Indian food habits. The domestication of plants and animals are reported in the subcontinent during that time. Wheat, barley and jujube were among crops cultivated, sheep and goats were among the animals domesticated for food. In the Neolithic period roughly 8000-5000 BC, agriculture products were the dominant mode of food products. Agricultural communities became widespread in Kashmir valley around 5000 BC. As early as 4530 BC and 5440 BC wild Oryza rice appeared in the Belan and Ganges valley regions of northern India. The earliest evidence of food in ancient India comes from excavated sites in the Indus Valley Civilization. Indus Valley civilization relied on the considerable technological achievements of the pre-Harappan culture, including the plough. The farmers of the Indus Valley grew peas, sesame, dates and rice. Agricultural activity during the second millennium BC included rice cultivation in the Kashmir and in other Harrappan regions. Several wild cereals, including rice, grew in the Vindhyan Hills, and rice cultivation, at sites such as Chopani-Mando and Mahagara, was underway as early as 7000 BC. The picture of ancient Indian food becomes much clearer after the Aryan settlement in the Gangetic planes. The compilation of the religious scriptures gives vivid account of the food that was in vogue during that time. The people who settled in the Gangetic plains were good farmers. They ate both vegetarian and non-vegetarian foods. 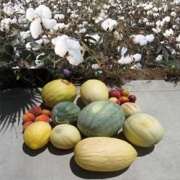 They cultivated barley wheat rice, melons and cotton. They domesticated cow, pigs, buffalo and sheep. They lived in banks of rivers and caught fish from river with fish hooks. The Vedic literature throws considerable light on the food and drink habits of the people of the ancient India. Among the food grains, the Rig Veda repeatedly mentions barley, particularly fried barley. Of frequent occurrence is the word `anna` which may not essentially mean rice; it denotes food in general. India Foods Rice and wheat appear to have been the staple food in the age of Brahmanas. 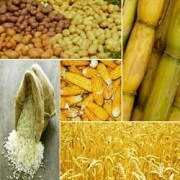 Different products of barley and rice, mentioned in the Aitareya are dhana, karambha, parivdpa, purodds`a andpayasyd. These were mainly fried barley; cooked with butter, powder of dhana fried with butter, parched rice fried in butter, rice-cake, mixture of curd and milk. Milk and various milk products that were used include clarified butter, curdled milk, dadhi (curd), karambha (porridge), ghrta (unmelted butter), navanita (cream or fresh butter), sdnndyya (mixture of curd and milk), mixture of milk and sotna, cam (milk, curd, honey, butter etc. mixed together), sara (thickened surface of milk), etc. Udumbara (sacrificial fig), jujube and berries are some of the edible fruits mentioned in the Brahmanas. Shatapatha Brahmana mentions sugarcane. Aitareya Upanishad mentions shoots of Banyan trees and fruits of fig. In the Kalpasutra the mentions use of various food grains, namely rice, barley, wheat, millet, sesame and pulses have been found. 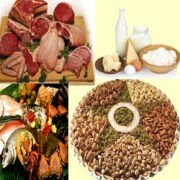 In ancient India meat was not only eaten, but was also regarded as the best kind of food. The meat of barren cows and sterile ox, goat and sheep was a delicacy. We learn from the Shatapatha Brahmana and Aitareya the vogue of beef-eating; it used to be served to a king or other highly respectable guests. The Sutras also bear clear testimony to meat-eating. Meat, both roasted on spits and cooked in pots, appears to have been in use. It was an essential element in madhuparka offered to distinguished guests. The Dharma sutras shed considerable light on the meat permitted and prohibited. As regards bird-meat, the Dharma sutras mention many birds permitted or prohibited. Also prohibited are the aquatic creatures called porpoise, nakra, kulira, cefa and gavaya. The Vedic texts also mention the usage of the meat of bulls, horses, buffaloes and even of dogs. Vegetarian food, excluding animal and fish meat became the norm only after the coming of Buddhism. 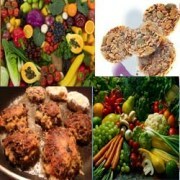 In the Gupta period people mostly ate vegetables, cereals, fruits, breads, and drank milk. Melons and Cotton Of the fruits, mango seems to have been common. Apastamba Dhamasutra mentions it as a familiar example. Other fruits mentioned in the Sutras are kharjura (dates), variety of jujube called Badara, Karkandhu and Kuvala. Of the vegetables and juicy substances, prohibited are karanja (red garlic), kisalaya (sprouts), kydku (mushroom), lasuna (garlic), nirydsa (substances exuding from trees; etc. Among the drinks mentioned are sura, honey, milk and fruit-juice. The Taittiriya Upanishad, mentions sura to be extracted from certain herbs or fermented from rice. Madhu (honey) appears to have been used as an article of food. A preparation of fried rice, called laja, is mentioned. Dadhimantha perhaps means liquefied curd or clarified butter. Milk (kslra), curd (dadhi) and ghee is also mentioned. In the age of Sutras, the drinks that appear to have been in vogue besides milk are Takra (butter-milk mixed with water) and Mantha (a preparation of dry barley meal stirred in milk, curd, water or melted butter). cultivated cropsThe Veda also testifies to the wide prevalence of drinking wine. In the Vedic texts, among drinks that are mentioned are wine and somarasa; the latter was, perhaps, used by the upper classes, particularly in sacrifices. Somarasa appears to have been confined to the priestly class. As regards intoxicating drinks, surd or spirituous liquor was the commonest. Surd appears to have been a very popular drink, especially at marriage and certain other rites. Surd is condemned in Shatapatha Brahmana. iThe Shatapatha Brahmana also condemn Parisrut that appears to have been semi-fermented liquor. The two drinks were specifically prohibited for Brahmanas. In certain ancient literary texts, female dancers drinking wine are mentioned. Other such drinks are madhu and maireya. Their popular food in ancient India was products of wheat served with barley or rice along with fish and meat. Karambha seems to have been a popular food; it may mean a sort of gruel made with flour and curd or a sort of porridge prepared with unhusked, parched and kneaded barley grains. Ksirapakvaanna, apupa (cake) appear to have been delicacies and crushed grain, mixed with curd, was also relished. Puroddsa (a kind of cake) was used in sacrificial offerings. Among the preparations of rice are mentioned odana (cooked with water) and payasa or ksiraudana (cooked with milk), sthdlipdka (rice or barley cooked with milk or water) appears to have been a special dish meant for ceremonial occasions. Dhanya is also mentioned, so is saktu (pulverised grain) that was commonly used. Salt and sugar appear to have been added to food for adding to the taste. Among the condiments, Pippali (long pepper) and marica (black pepper) are mentioned. Two kinds of cakes, made of ground corn, are mentioned. Of these, Purodds was offered chiefly in sacrifices and Apupa was generally eaten by the people. An inquisitive practice in vogue in ancient India was that certain articles, including a preparation of ground rice, barley or sugarcane-juice, were offered to serpents. Gupta Empire foodIn the Ramayana it is mentioned that the Aryans were accustomed to both vegetarian and non-vegetarian food. The vanaras (monkeys) were used to vegetarian food alone, their food having been fruits, roots and leaves. The Raksasas were carnivorous. The Aryan people mainly used rice, barley, wheat and pulses. Boiled rice appears to be the most popular food. Refined rice, mixed with curd and milk, was a favourite dish. Among milk products, curd, curd mixed with sugar and ghee was used. Meat-eating appears to have been widely prevalent both among the Aryans and the non-Aryans. So far as drinking wine is concerned, the Ramayana condemns the practice particularly among the Brahmanas. Wine appears to be of two main varieties, namely distilled and natural. Among other drinks mentioned are honey and madhuparka, the latter being an admixture of curd, ghee, honey, sugar and water. From certain references in the Mahabharata sesamum appears to be used as food. Milk and milk products like curd, ghee is mentioned. Of the sweets, cakes (apilpa), and sugarcane-juice (i.e. molasses) are mentioned. Fruits, even some wild varieties, were eaten by people. As regards meat-eating, the Mahabharata allows it at some places while condemning it at others. The meat of birds also appears to have been edible; their species, however, is mentioned. Further, from certain references fish appears and used as food. 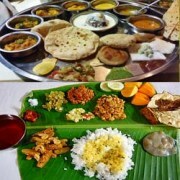 The food habit of the people in ancient India was vegetarian and non vegetarian. While the vegetarian products were based on agricultural, that included cereals, fruits and vegetables, the non vegetarian product came from domesticated animals and fishing. As the economy was primarily agriculture, there was plenty of food available for everyone in ancient India.